In an interview earlier this week, high-flying Clippers forward Blake Griffin said that the “Lob City” nickname the team coined two years ago had been retired. “We’re moving on and we are going to find a new identity during training camp,” he said. The team’s quest to find a new identity continued Wednesday night, when the Clippers hosted a practice and scrimmage at the Galen Center. The team ran a fast-paced half-hour of practice, where they went over pick and roll drills, some offensive sets and some transition defense, then played in a quick scrimmage. The Clippers worked on building their team chemistry in front of season ticket holders who had been invited to take in the preseason workout. Also taking it in was USC sophomore forward Darion Clark, who walked in right as the Blue-White Scrimmage got underway. For Clark, the scrimmage represented an opportunity to dream about his own future on the hardwood. Clark has three seasons at USC to prove himself for the professional circuit, but Rivers has a much shorter timetable to get his team into championship shape. The Clippers have nine preseason games before their season tips off on October 29 against the Lakers, and those matchups will provide valuable time to experiment for the new coach. 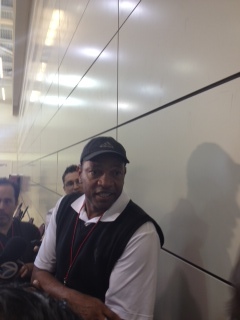 He’s also not concerned by the comments from Griffin declaring that the Lob City moniker has been retired. Rivers specifically refuted the notion that the Clippers are going to be a much slower-paced squad for the 2013 season. The Clippers did not run much in their scrimmage, though. The two eight-minute halves were marked by a slow pace of play, as each team went through a variety of half-court sets. 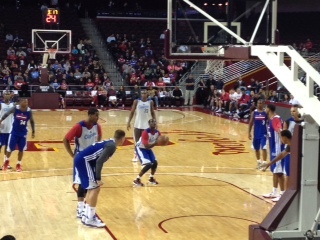 Chris Paul orchestrated the methodical offensive play for the Blue team, a squad composed mostly of Clippers starters. Darren Collison ran plays for the White team composed mostly of Clippers backups. The UCLA product had what proved to be the game-winning bucket when he hit a lay-up and drew a foul with 30 seconds left to put the White team up by two. The White team, made up of Collison, Jamal Crawford, Byron Mullens, Maalik Wayns and Antawn Jamison, held on to win after Blake Griffin could not hit two free throws with under ten seconds to play. Collison, who previously backed up Chris Paul when the duo played with the Hornets, will anchor a second unit that impressed Doc Rivers with their play during the scrimmage. The unit has only three more weeks to play against the first unit every day in practice. Still, the Clippers are not rushing with Rivers at the helm.